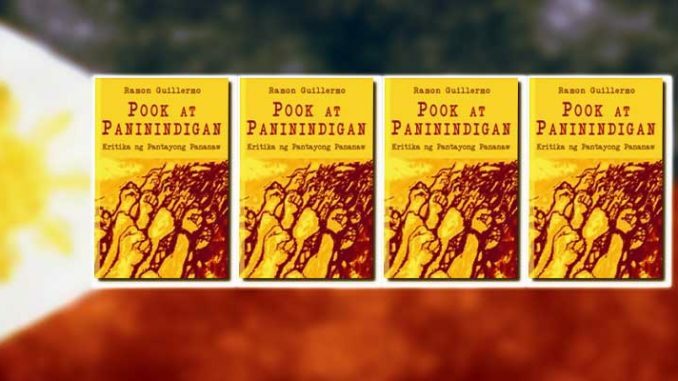 The complex relationship between two “progressive perspectives” or “projects” – Marxism and the Pantayong Pananaw (PP, the “from-us-for-us” perspective) – is the subject of Ramon Guillermo’s new book. Although this engagement between a class and a “cultural” perspective was already evident during the 1896 revolution, in labor associations in the 1930s, and among nationalist academics in the 1970s, Guillermo’s is one of the first academic books to directly and purposively blend these two perspectives. It follows the author’s other timely attempts at a new, comprehensive, and in-depth inquiry into the engagement between Marxism and PP (1999; 2001; 2003), as well as works by Nancy Kimuell-Gabriel on slaves in Philippine history (1999; 2001) and Zeus Salazar’s translation of the Communist Manifesto (2000). Guillermo addresses these goals in the two major sections of his book. In “Pook” (Location), he examines the “most sophisticated and non-simplistic representations” of the ideological/intellectual position that dismisses Marxism as a “foreign ideology.” Guillermo decribes PP, which was started by Salazar (Navarro et al. 2000), as “one of the most serious and most ambitious projects aimed at understanding Filipino culture in the intellectual history of the Philippines.” Guillermo’s theoretical and methodological discussion of “people’s culture” as a way of understanding PP is extensive and multilayered. It avoids the problems of earlier reviews that were “uneven in their explications or were quick to dismiss it without closer investigation.” These conclusions often arose from associating PP with “intellectual production” of the “post-Marcos era” on the “local scene” (Abinales 2003 and 2004) or with “Philippine nationalist historiography” (Diokno 1997). It is not difficult to read Guillermo’s book as “emerging from Pantayo,” as argued by an earlier reviewer (Asa 2002). This is also nothing new: earlier examinations had discussed “coming out of,” “going beyond,” or “incorporating” PP (Enriquez 1994; Llanes 1999). Guillermo’s book stands out, however, because he approaches the critique “not only ‘from the outside’ but also by drawing out the threads of its narrative” which “serve to underpin its explanatory strength.” He does this by unearthing the complex meanings of “people’s culture” and the concept of “inclusive we-us-ness” as “a totality-with-contradictions” through the prism of the Marxist notion of class struggle. In effect, he interrogates PP by insisting on a class standpoint. The “emerging from Pantayo” standpoint is strengthened in his examination of the “early socialist literature” of Santos, Aguilar, and Hernandez, particularly as they relate to “international theorizing over the complicated relationship between Marxism and nationalism.” In the Philippines, the prevailing argument treats “indigenous pre-Marxist ideologies” and “peasant millenarian world views” as “handicaps” one must “transcend,” as Marxism’s “long-time enemies,” and “spectres that find ways to rise from the dead” (Asa 2002; Nemenzo 1984). Instead, Guillermo focuses on the comparabilities rather than the contradictions between “people’s culture” and Marxism. As much as Guillermo wants to emphasize “emerging from Pantayo,” one can read the book as grounding itself within the perspective. This is evident in his discussion of works that “tease out” and “assign” meanings to terms like pag-aandukha [impoverishment], pag-aangkin [appropriate] and pagtatalaban [opposition] as they are articulated in everyday life (Alejo 1990; Ferriols 1991; Covar 1995). The book is an attempt both to engage Salazar, the main PP theorist, within Pantayo, as well as to enrich connections between the “socialist tradition” represented by Santos, Aguilar, and Hernandez and their communist counterparts Crisanto Evangelista, Luis Taruc, the Lava brothers, and Jose Ma. Sison. Guillermo may not agree with this interpretation, but there is much in his book that confirms the grounding in a cultural or civilizational context of such diverse interactions as conflict-collaboration-association, coming together-comradeship-assimilation-connection, and difference-separation-incongruence-contradiction (Navarro 2000; 2001). This is equally confirmed by other authors: Torres-Yu (1993) looks at changes in Filipino civilization in terms of the “great cultural divide” that shapes “Filipino Cultural Discourse,” Aquino (1999) at the “union and interaction” of the “people” in a “Social Organization,” and Mendoza (1999; 2001; 2002) at “culture politics” and “culturalism’s intersection with the economic” in “unification” and “national discourse formation. Salazar may still be unable to see the need for an intellectual to take a partisan position in favor of the oppressed, marginalized, and powerless, even in light of the strong role of the state in his discussions of nationalism and nationhood (Hau 2000a; 2000b). But it is a stance that other proponents of PP have already adopted (Kimuell-Gabriel 1999; 2001; Navarro 2000; 2001). As a peoples’ discourse, PP is neither “homogenous” nor a “monolithic system,” contrary to the earlier assertions of critics (Asa 2000; Diokno 1997). PP’s variability may enable Guillermo to recognize the ease with which one can imagine “Pantayo Marxism/Filipino Marxism” – an amalgamation for which Kimuell-Gabriel has repeatedly argued. Whether it is “emerging from Pantayo” or “grounding itself within Pantayo,” this latest book constitutes a clear “Filipino contribution” to the discussion of the complex relationships between nationalism and Marxism. It is a contribution to both kadalumatang bayan (instruments of organizing knowledge based on the organization, totality, and capacity of a people) and kadalumatang makabayan (means of organizing knowledge with a partisan perspective or position favoring the promotion of the welfare, interests, and rights of the people) – ideas that Guillermo explored in his earlier “exposition, critique, and new directions for Pantayong Pananaw” (2003). Thus we are sure to see a fresh upsurge in debates between PP and Marxism, all leading to a nationalist Pantayo Marxism/Filipino Marxism that will be a much superior outlook to one that is simply Marxist. Abinales, P.N. 2003. “Benedict Anderson in the Philippines.” Introduction to Imagined Communities: Reflections on the Origin and Spread of Nationalism. Pasig: Anvil Publishing, 2004. ———. 2004. “The Question of Location.” Forum 5 (May-June): 9. Aquino, C.C. 1999. Mula sa Kinaroroonan: Kapwa, Kapatiran at Bayan sa Agham Panlipunan. Quezon City: University of the Philippines CSSP Publications. Alejo, A.E. 1990. Tao po! Tuloy! Isang Landas ng Pag-unawa sa Loob ng Tao. Quezon City: ORP-SAS, ADMU. Asa, R.C. 2002. “Paglabas sa Pantayo.” Philippine Collegian 80 (2 August): 5. ———. 2000. “Pero Bakit Pilipino: Pilosopiya at ang Problema ng Kabuluhan.” Sinag 26 (1): 24-27; and Sinag 26 (2): 17-20. Covar, P.R. 1995. Kaalamang Bayang Dalumat ng Pagkataong Pilipino. Quezon City: University of the Philippines CSSP Publications. Diokno, M.S. 1997. “Philippine Nationalist Historiography and the Challenge of New Paradigms.” Diliman Review 45 (2-3): 8-13. Enriquez, V.G. 1994. Pagbabangong-Dangal: Indigenous Psychology and Cultural Empowerment. Quezon City: Akademya ng Kultura at Sikolohiyang Pilipino. Ferriols, R.J. 1991. Pambungad sa Metapisika. Quezon City: ORP-SAS, ADMU. Guillermo, R.G. 1999. “Pook at Paninindigan sa Pagpapakahulugan: Pag-uugat ng Talastasang Sosyalista sa Kalinangang Bayan.” Master’s thesis, University of the Philippines, Diliman. ———. 2001. “Rebyu ng Salin ni Zeus A. Salazar ng Manifesto ng Partido Komunista.” Philippine Humanities Review 5: 246-253. ———. 2003. “Exposition, Critique and New Directions for Pantayong Pananaw.” Kyoto Review of Southeast Asia 3. Hau, C.S. 2000a. Necessary Fictions: Philippine Literature and the Nation, 1946-1980. Quezon City: Ateneo de Manila University Press. ———. 2000b. “The ‘Cultural’ and ‘Linguistic’ Turns in Philippine Scholarship.” Paper presented at the International Conference on Ruptures and Departures: Language and Culture in Southeast Asia, University of the Philippines, Diliman, 19-21 January 2000. Kimuell-Gabriel, N. 1999. Ang Timawa sa Kasaysayang Pilipino. Quezon City: Palimbagan ng Lahi. ———. 2001. “Timawa: Kahulugan, Kasaysayan at Kabuluhan sa Lipunang Pilipino.” Master’s thesis, University of the Philippines, Diliman. Llanes, F.C. 1999. “Kasaysayang Bayan: Pagsulat ng Kasaysayan ng Bayan (Isang Panimula Tungo sa Paglilinang).” ADHIKA 1: 3-23. Mendoza, S.L. 2000. “Between the Homeland and the Diaspora: The Politics of Theorizing Filipino and Filipino American Identities.” Ph.D. diss., Arizona State University. ———. 2002. Between the Homeland and the Diaspora: The Politics of Theorizing Filipino and Filipino American Identities. New York and London: Routledge. ———. 2001. “Nuancing Anti-Essentialism: A Critical Genealogy of Philippine Experiments in National Identity Formation.” In Between Law and Culture: Relocating Legal Studies, ed. L. Bower, D.T. Goldberg, and M. Musheno, 224-245. Minnesota: University of Minnesota Press. Navarro, A.M. 2000. Ang Bagong Kasaysayan sa Wikang Filipino: Kalikasan, Kaparaanan, Pagsasakasaysayan. Quezon City: Palimbagan ng Lahi. ———. 2001. “Kasaysayan, Agham Panlipunan at Pilosopiyang Pilipino sa Diwa ng Talastasang Bayan: Tungo sa Pagbabalangkas ng Progresibong Multi-Perspektibong Aktibismo.” Paper presented at the conference TUNGGALIAN! Isang Talakayan-Paglilinang ng mga Perspektibo ukol sa Pagsasa-Pilipino ng Agham Panlipunan, University of the Philippines, Diliman, 17 June 2001. Navarro, A.M., M.J. Rodriguez, and V. Villan, eds. 2000. Pantayong Pananaw: Ugat at Kabuluhan; Pambungad sa Pag-aaral ng Bagong Kasaysayan, new ed. Quezon City: Palimbagan ng Lahi. Nemenzo, F. 1984. “The Millenarian-Populist Aspects of Filipino Marxism.” In Marxism in the Philippines: Marx Centennial Lectures, ed. R. David, 1-40. Quezon City: University fo the Philippines Third World Studies Center. Salazar, Z.A, ed. and trans. 2000. Karl Marx at Friedrich Engels: Manifesto ng Partido Komunista. Quezon City: Palimbagan ng Lahi. Torres-Yu, R. 1993. “Tungo sa Pagbuo ng Filipinong Diskursong Pangkalinangan. Ikatlong gantimpala.” In Mga Piling Diskurso sa Wika at Lipunan, ed. P.C. Constantino and M.M. Atienza, 296-308. Quezon City: University of the Philippines Press, 1996.